One of the aims of Peeblesshire Archaeological Society is to promote awareness of the extremely rich archaeological heritage of the region. In recent years, the Society has undertaken successful projects on local sites at Lyne Kirk and more recently at Harehope in the Meldon Valley, to improve their condition and make them better known. These two projects have been carried out under the auspices what is known as the Adopt-a-Monument scheme, run by Archaeology Scotland. Adopt-a-Monument is a nation-wide Community Archaeology scheme that provides volunteer groups with the practical advice and training they need to care and conserve their local heritage. The aim of the national project is to encourage local groups to get involved in hands-on activities to improve the condition, accessibility and interpretation of selected local sites. 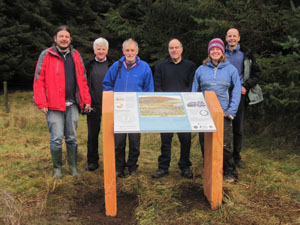 At Harehope, for example, members of the society carefully cleared vegetation from an important overgrown prehistoric burial cairn and an attractive interpretation panel has been installed to explain the significance of the site.